Barack Obama just had a prehistoric lizard named in his honor. Can you guess why? Creative taxonomy — it's what happens when scientists discover an as-yet unnamed species and find some way to connect it to a person, place, or thing. Sometimes that person/place/thing is famous. Sometimes it isn't. Sometimes the connections between the two make perfect sense. Other times the connections are more tenuous. 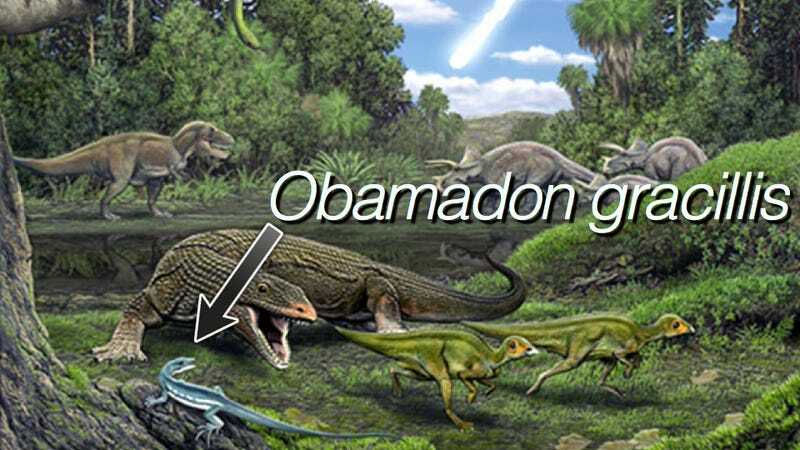 So when we heard the news that a prehistoric lizard had recently been named after President Barack Obama (scientific name: Obamadon gracilis), we were obviously keen to find out the reasoning for it. What are the very punniest scientific names? Can you guess? You're not going to guess. According to researchers Nicholas R. Longrich, Bhart-Anjan S. Bhullar and Jacques A. Gauthier — who describe the newly discovered species in the latest issue of Proceedings of the National Academy of Sciences — the Obamadon is so named because of its teeth. Of course. The lizard is believed to have gone extinct at the end of the Cretaceous, following the devastating Chixculub asteroid strike. It is a small polyglyphanodontian distinguished by tall, slender teeth with large central cusps separated from small accessory cusps by lingual grooves. The genus name refers to Barack Hussein Obama and odon (tooth in Greek), in reference to the tall, straight teeth, and the manner in which Mr Obama has acted as a role model of good oral hygiene for the world. Longrich, who led the study, went on to clarify: "No one should impute any political significance to the decision to name the extinct lizard after the recently re-elected U.S. president. We're just having fun with taxonomy." In the concept art pictured up top, the carnivorous lizard Palaeosaniwa stalks a pair of hatchling Edmontosaurus as the lizard Obamadon looks on. Created by the very talented Carl Buell; fossil dentary via Longrich et al.